I’ve had Rhinebeck 07 on my mind since the moment we returned last year. Now that we’re a little closer I’m starting to think about what I might want to make to wear. 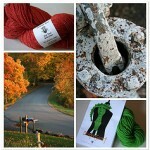 I was so impressed with the quality and quantity of gorgeous handknit sweaters at Rhinebeck last year. It makes perfect sense — there’s no better place to show off your handknits, and the weather couldn’t be more perfect. So, here are a few of the designs I’m considering. I don’t have a good direction yet — I’m still pondering. It took me almost a week to compile this list alone! If you click on the mosaic you’ll be brought to my flickr set with details about each one of the images. Feel free to suggest something else. It’s a shame that Veronik Avery’s Knitting Classic Style and Fiona Ellis’ Inspired Fair Isle Knits (*love* the scarf on the cover!) isn’t coming out until September and October. I’m sure there’ll be something in there I’d like to make. Wow – I hadn’t even heard of the new FE book. I still have Gathering Intentions on my to-knit list from her cable book! I think the pewter coat would be the most versatile for that time of year. You seem to be on a cable theme, have you looked in Cables Untangled? I’m working on something from that now and there are several patterns in there that are somewhat related to what you have here. P.S. I’ll probably be at the shop Sunday afternoon if you want to stop by and say hi! My vote’s for the bottom right hand corner, I think – they’re all nice though. wow – you have an embarrassment of rich choices there! that phildar hoodie has been on my list forever — I totally love it. my vote would be that or celtic dreams – also gorgeous. but really, you can’t go wrong with any of them. I think I’m going to make it to rhinebeck this year — a first for me! is it cheating if i say i’m going to wear the Jaywalkers (they’re just about finished!!!)…. 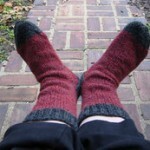 maybe i’ll try to knit another two pairs of Rhinebeck-yarn socks and just sock-it-up for the ‘fest. The Pewter Coat is on my someday list. St. Brigid is a classic of course, although I think it’s best that you steer clear of that so as not to doom yourself. Celtic Dreams is a really good contender. I love how fitted the hoodie is! You know, I think whatever you make will be beautiful. And I agree: one of the most inspirational things about Rhinebeck is seeing all the gorgeous knitting. Between lace and fair isles, it was tremendous. the phildar hoodie would be my choice, it looks gorgeus. I love the hoodie and Juno is gorgeous! I’ve got the yarn sitting and waiting for the Swedish Heartwarmer Shawl. If you decide on that one, I’ll totally start mine, and we can have a knit-along! Don’t worry, I’m nowhere near Rhinebeck, so we won’t be shawl twins in the same place. Bear in mind that last year was good sweater weather, but the year before was more sweating weather! I wore a tank all day… maybe you need two options? 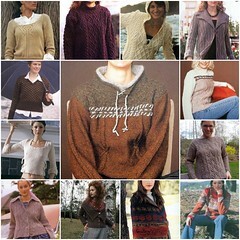 …oh gosh, do I need to knit two Rhinebeck sweaters, one for me AND one for Kaya? What good choices! Some of my favorites are on there! Of course, I love the Tweedy Aran cardi (which I have the yarn for, but will I ever get to it with all the wedding planning?). I *love* Celtic Dreams, I really want to make the Turbulence sweater (I’ve seen lovely versions on ravelry) and I really, really love the wrap/shawl from Handknit Holidays. Those are my votes! My number one would be the wrap/shawl, but that’s also a lot of work! I googled and found the pdf for the corset pullover. I vote for the Swedish Heartwarmer Shawl. I can’t find evidence on the Internet that anyone has finshed that shawl (or started)… you could be the first. You’d be the only one at Rhinebeck wearing one, that’s for sure. You know what my choice is…Celtic Dreams! My vote is the u-neck sweater. But I’m partial to u-necks at the moments. The knots and barn sweater is interesting though…. I love that Phildar hoodie! What a chuckle I got to see myself up there with all those (skinny – yikes) models! They are all great choices. I have always wanted to make Tweedy Aran. You have re-inspired me! I love the Phildar Hoodie, myself! I think it would be a great basic for layering, so no matter what the weather throws at you, you can layer and un-layer as needed. I’ve made the corset pullover from Interweave for my mom (although I did it before I got a blog, so there is nothing on there about it). It was a great little knit, but it’s awfully short. I’d suggest making it a lot longer if you choose that one. I’m cracking up becasue I missed this post first time around, but 9 f these are on my own list, most of them in my present “what to do” negotiation.